Good morning! It’s Small Business Chat update time, and today we have another third interview, from Jules White (was Jules Thomas) of The Last Hurdle. We last caught up with Jules in November 2012: when asked where she wanted to be in a year’s time, she replied, “In another year I hope to be very close to the successful completion of the Franchise pilots and have a fantastic working model, to accompany the extensive training programme and support packages. The proof is in the pudding!” So, how’s she doing with that plan …? Yes and a bit further, I have 2 pilot Franchises running, both doing rather well, which is very encouraging. We are about to move into a much larger office to accommodate our much larger team. I am very pleased with our progress over the last 12 months. We have continued to grow over the last year, we now have a team of 8 business development specialists and we are looking forward to moving into our new headquarters in the next couple of weeks. We have signed contracts on a 1000 sq ft office in Towcester to incorporate the head office for the Franchisor company (Head Quarters) The Northampton Branch and one of our franchise offices. On a personal note, I am pleased to say I am expecting a new addition to The Last Hurdle in April, I have received comments that the baby will come out with a mobile phone and desk ready to join the team. We have recently won our biggest contract to date with a letting franchise and I will be looking to duplicate this success with other franchises. 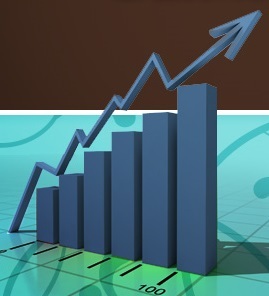 We have already overachieved the targets I set for this financial year. Earlier this year, in March, our apprentice Ellie joined us and has been an absolute godsend. Ellie is due to complete her apprenticeship in the spring and I am already recruiting for another apprentice. I am still on a huge learning curve and my biggest assets are the team around me. Learning to delegate when you are a bit of a control freak is not easy, as you can imagine, however, with a strong team (who at times are willing to wrestle work from me) I am confident that we can accomplish anything we aim for! Surround yourself with positive influences, try to remove all negative influences as these have more effect than you might wish. Concentrate on the positives, you will find you will aim for what you focus on! Consider the apprenticeship scheme, this is a great incentive for you to be able to train a member of staff to do things your way, whilst the training side of the qualification is carried out by the partner. Highly recommended. Consistency is key to successful business development, don’t lose faith and KEEP GOING! Writing our own NVQ courses, to develop our training programmes. Completing the pilot schemes with our two franchisees and honing the offering for full franchises until they are ready to market. Ensuring that all suppliers are secured (nearly completed) with performance agreements in place. Wow – that’s a lot of achievement this year, with steady and planned growth achieving more than the planned targets – great stuff. I think we all have a lot to learn from the tight control but ability to expand that the company is experiencing. Jules also had this lovely comment to make about this series, reproduced with her permission: “This exercise is great! Really good to see what I wrote last year and the year before … I think I would probably still share if things were not so good, so keep sending them every year! A great project to be involved with.” It’s a lot of hard work publishing and following up these interviews, so it’s really, really lovely to get such feedback – thanks, Jules, and we’ll look forward to hearing your news next time around! You can find The Last Hurdle on the web at website www.thelasthurdle.co.uk, and on Facebook, Twitter and LinkedIn. 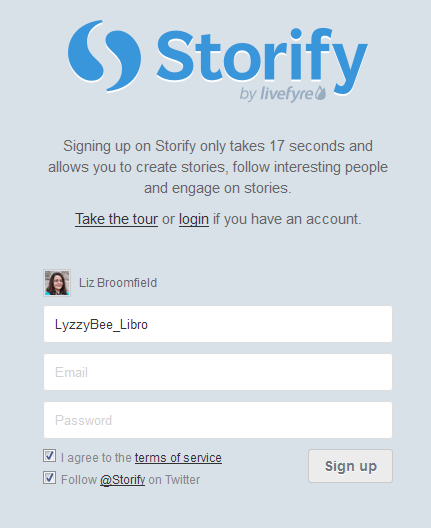 In response to a request for information*, today I’m going to be talking about Storify: what is it, why would you use it, and how do you use it? I wasn’t already a user, so this post takes you through the stages of logging in and creating your first story through screenshots created as I did it for the first time myself! 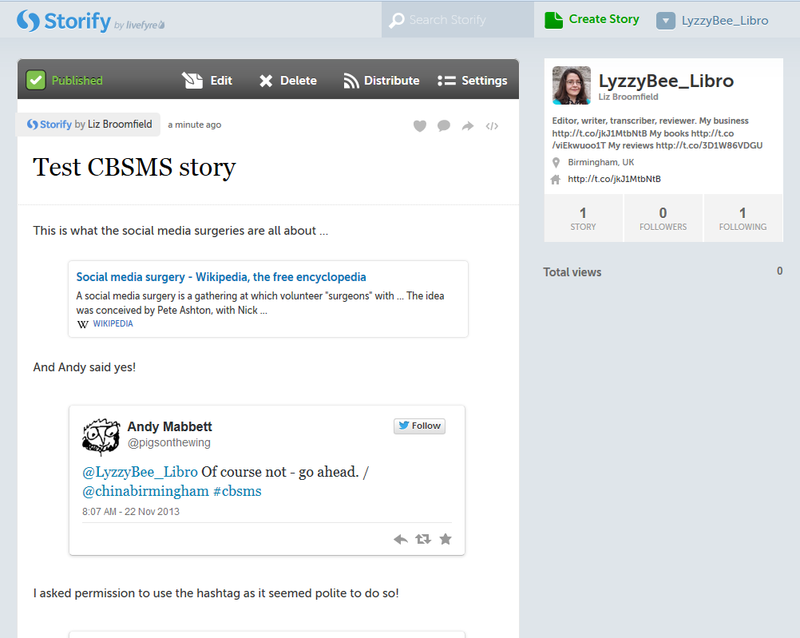 Storify is a social media tool that lets you create stories or timelines from a variety of social media resources like Facebook and Twitter, as well as other web resources. You can use it to pull together information on whatever you want, and can customise it how you want, then share your story on the site with your friends on those social media sites. 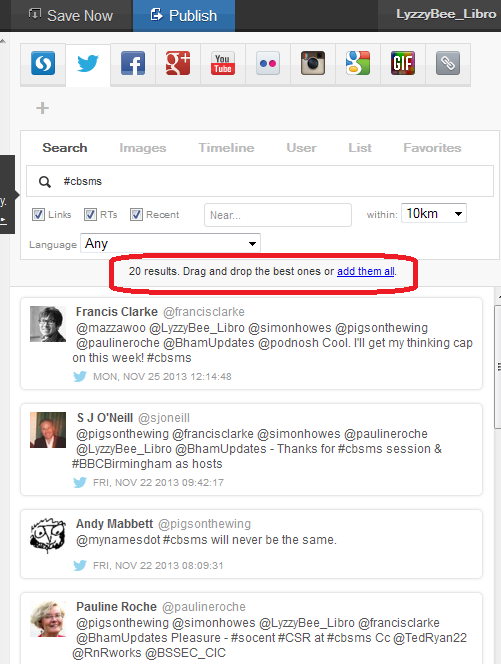 I’ve mainly come into contact with Storify in relation to events. For example, Karen Strunks pulls together a Storify after every Social Media Cafe in Birmingham. She gathers any Tweets and Facebook posts which have used the hashtag #bsms and creates a storyline showing the event through its before, during and after stages, and what people were saying about it. Here’s an example of one of her Storify stories. So you can see that it’s a great way to pull together information and images and make a story that you can share with others. 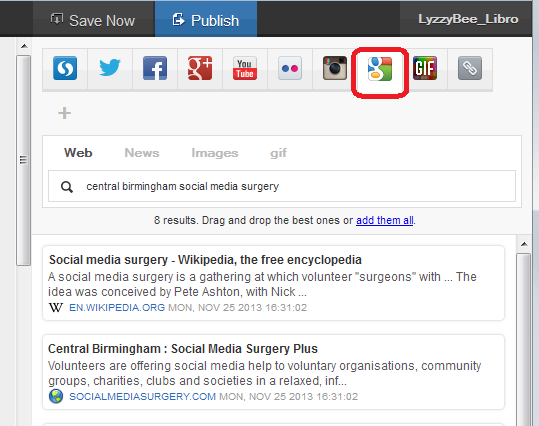 It’s useful for events, news on particular topics, or fundraising and awareness raising campaigns. You don’t have to base it around hashtags (a hashtag is a short code with a # in front of it that creates a searchable link in Twitter and Facebook, etc., which allows you to find all of the tweets on a particular topic. For example, even if you’re not a member of Twitter, searching for the hashtag #amwriting, used by authors, will give you these results, all containing the hashtag (example)). 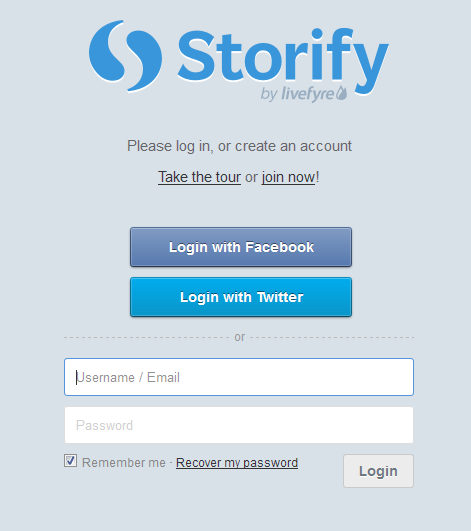 How do I join Storify? 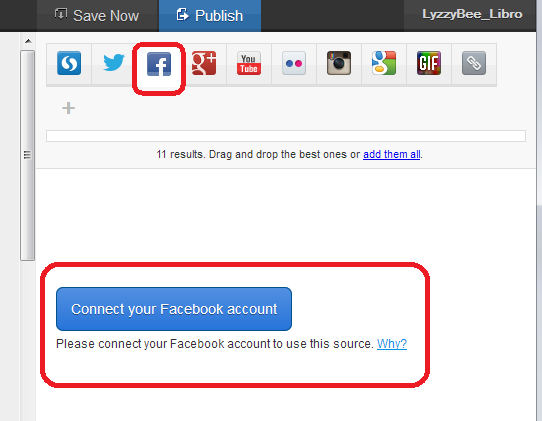 You will be given the option to log in using Twitter or Facebook. 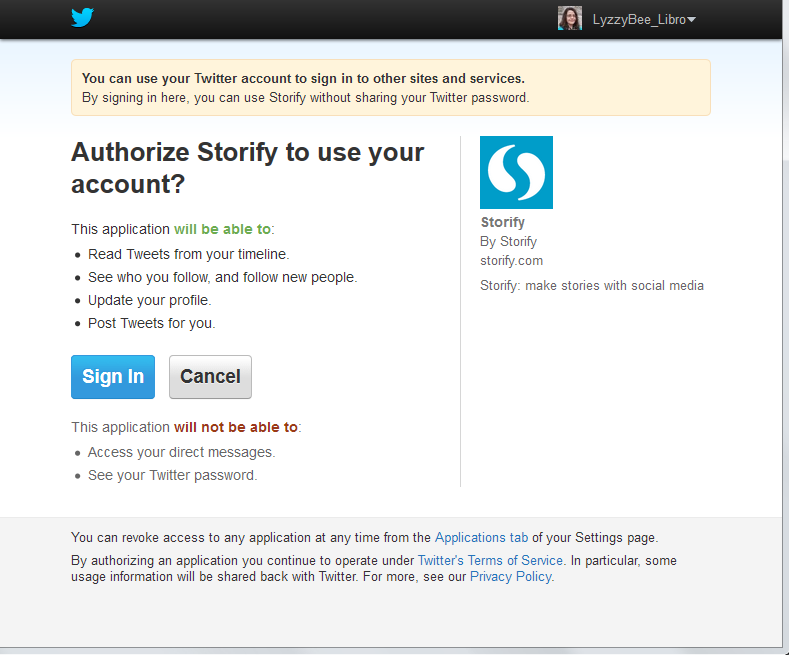 Actually, you will still need to create a password and account with Storify: what this does is associate your Storify account with your social media account. You can also just create a username and password. I chose to sign up using my Twitter account, as that’s what I use most for business and sharing. As it says, it only connects to your Twitter account and uses its authentication, it doesn’t see your password etc. And when it says it will Tweet for you, that’s only when you create a story, not randomly! And that was it, I was ready to create my first story! 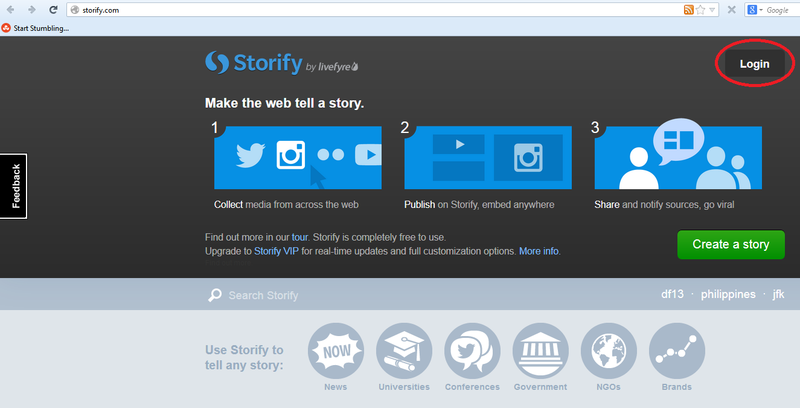 How do you create a Storify story? … and you’re taken to a slightly alarming page – alarming because it manages to look both blank and complicated! But look: little tips come up the first time you use it which guide you through what to do! Basically you’ve got an area where you create your story on the left and a place to search for content on the right. The first thing to do is create a name for your story. You can also press the Save Now button at this stage, which will prompt it to autosave as you go along. This means that you can pick up particular results but not all of them – useful if some of them are repeated or just ‘chatter’ that you don’t want to include. It also means that you can put them into whatever order you want, rather than the order imposed by the standard Twitter view (I made this one like Twitter, with the newest tweets at the top, but if you look again at Karen’s example, she switched it round to read from top to bottom). So I added a note explaining the last two entries in the story, where I checked it was OK to use the hashtag to create this worked example. 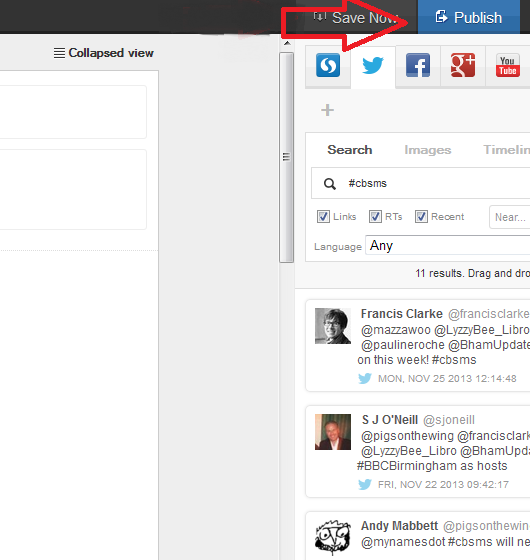 I then hit the Save Now button – which I mentioned earlier and should have done at the point at which I mentioned it! Just in case! 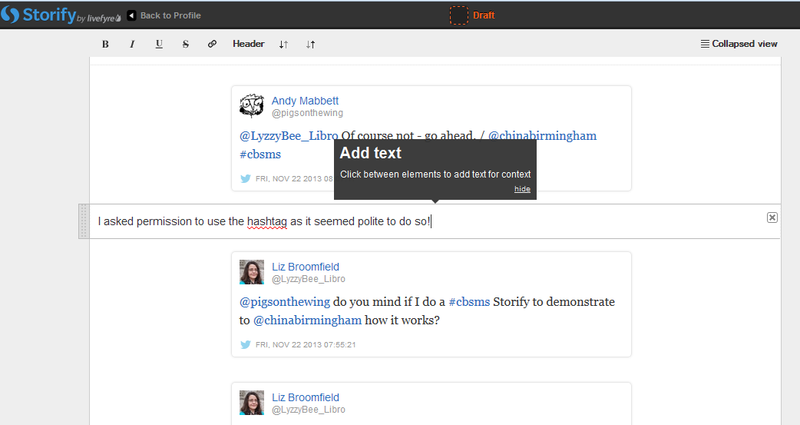 You’re not limited to creating a Storify from only one source. Along the top of the search area you can see loads of different options, including Facebook, Google+, YouTube, Google, and your own photos and links. Note that if you choose Facebook, you will need to log in and link it to your own Facebook account (again, this won’t do anything nasty, it just appears to need to use your own Facebook timeline. Of course, you can search for anything on Facebook once you’re logged in). You don’t seem to need to do that with Google+, though. 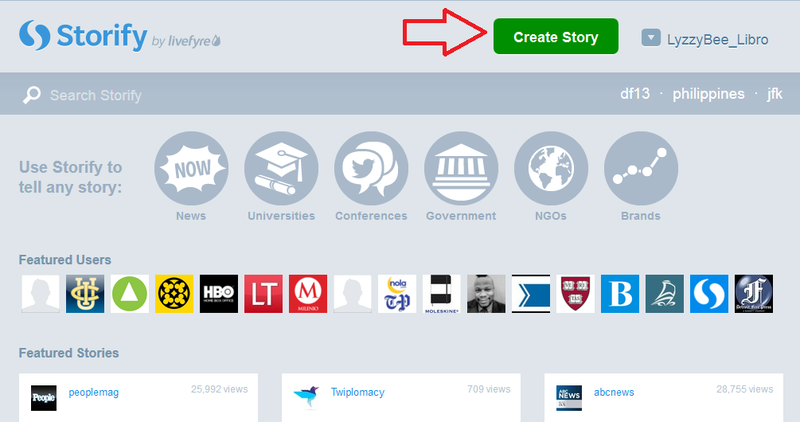 How do I publish my Storify story? I was ready to publish, so I clicked on Publish story. The next step was Share & notify. 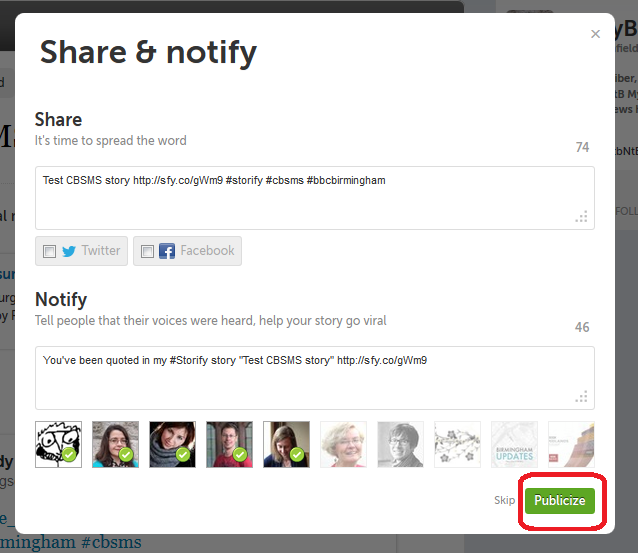 Sharing creates an automated Tweet with a link to your story. I imagine that if you’ve signed in to Facebook, etc., you will also be given the option to post an automated status update. Notify lets you autotweet anyone who’s a friend on Twitter and is mentioned in your story to tell them that their tweet has been included in your story. I really like receiving these notifications, so I left these ticked, but you can untick them if you don’t want to do this. This process creates my story in Storify. At this point, the story gets assigned a URL that I can quote in emails or add to my blog. In the case of this story, it’s http://storify.com/LyzzyBee_Libro/test-cbsms-story, and this stays with the story on my profile for ever more. What does my Storify look like on my Twitter account? 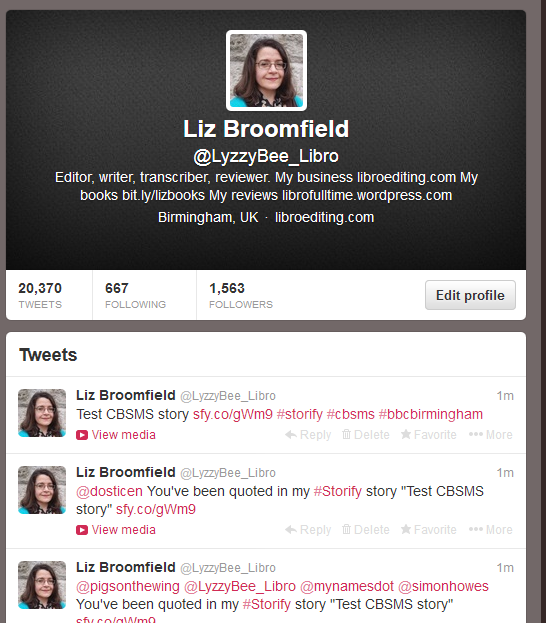 Finally, I popped over to my Twitter account to see what my story looked like on there. The top tweet is the automatic tweet with the link to my story, and the ones underneath are those ones that automatically tell people that they’ve been included. Exactly what it said it would do. 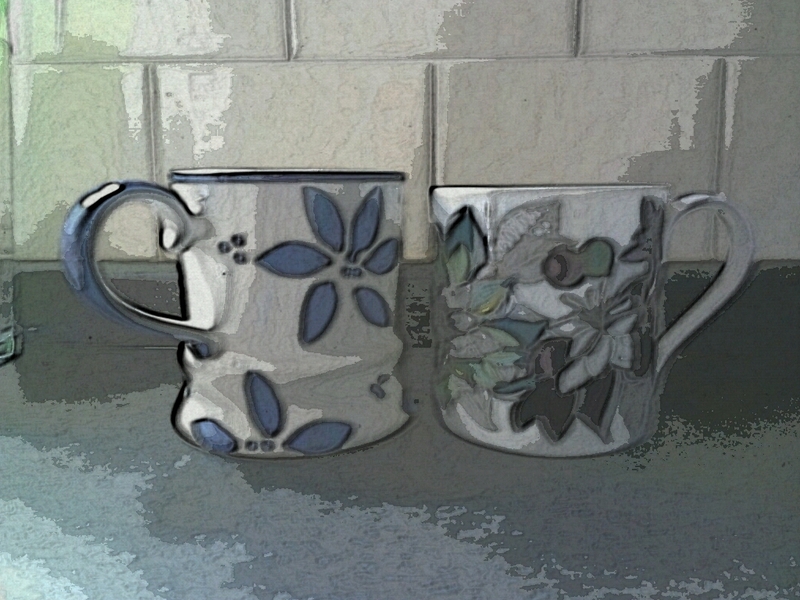 What else can I do with Storify? 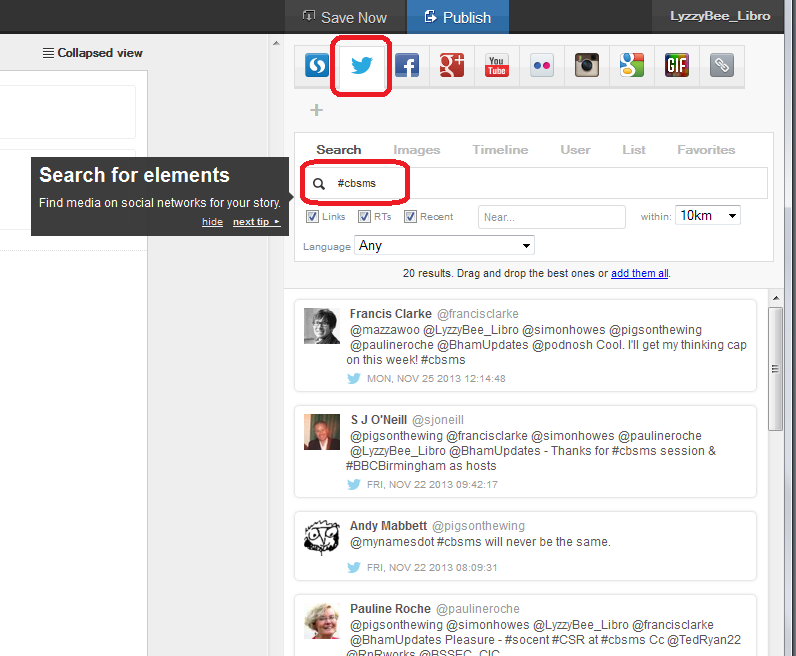 When you’re searching, you can refine your search to exclude retweets, etc. You can get a paid account which is useful for large businesses or organisations. This seems to allow a lot more customisation and also real-time updates – however, I like the editable nature of the free version and I’m not sure if that would get lost if real-time updates were running. Maybe someone who has a paid account will come along to share the uses of that. But I think most people will be OK with the free version. * I was helping the Chinese Community Centre in Birmingham at the November 2013 Social Media Surgery and they wanted to use Storify to pull together stories from their Oral History Project. We ended up talking about their blog rather than Storify, but I promised to put together some instructions for them. This one’s for you! Note: This is not a sponsored post, but an exploration of a potentially useful tool. 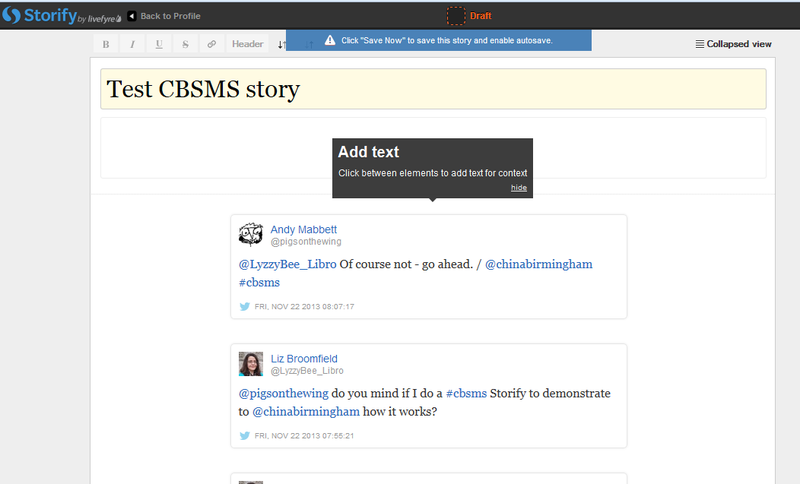 This post has taught you – through my own learning process – about using Storify. You can find more posts about using social media in the relevant part of my resource guide. If you would like more detail about how to use Storify for your content marketing, have a look at this article by Fiona Cullinan. If you’ve found this article useful and/or interesting, please do post a comment and share using the buttons below! Thank you! It’s time for another Small Business Chat update and we have another pair here, Maxine Johnston and Nathan Littleton, because I feel they’ve got a lot in common. Both started out doing their own specialised thing – parties in a box in Maxine’s case, and web design in Nathan’s, but such is their success that they’ve started to help other people to replicate it, one establishing services helping people with their marketing and the other by developing a vital new product and developing a career in public speaking. Career and business development is a big growth area, presumably because more and more people are setting up their own businesses. I’ve been asked by a few people about offering career counselling in my own industry area – but I’ve decided to stick to my core business activities. These two have branched out and are having an interesting and stimulating time with it! Maxine started off running Life’s a Celebration, which provides party boxes for all sorts of occasions. This is her third interview: she started off with the series back in October 2011 when her business had only just launched, and updated us in October 2012. At that point, when asked what the year ahead had in store for her, she said, “I have no idea is my honest answer. I feel blessed that I have achieved last year’s objective. At the moment I’m taking one day at a time. But I’d like to think that Life’s A Celebration is still going and is collaborating a lot more with potential partners. Perhaps I’d like to have somebody helping me and maybe be pushing and achieving more international sales“. Well, she did so well with her marketing that people started to ask her how she did it – and she’s bravely launched a whole new business on the back of that! Things have changed immeasurably with me and my business over the last year. Life’s A Celebration continues to trade, however, I have also been busy setting up another business called Maxine Johnston Marketing. This has come about because I was regularly getting asked to help other businesses with the marketing aspects of their business and a lot of my time was spent taking business owners through my own approach to marketing. As I said in my interview last year, the marketing and promotion side of Life’s A Celebration was always the aspect that I enjoyed so I decided to set up Maxine Johnston Marketing. This is taking up most of my time these days, as I am picking up clients and working closely with them to develop their marketing. Maxine Johnston Marketing is different from other marketing companies out there in that I will also undertake the work that people just don’t get time (or have the inclination) to do. So things like newsletters, blogging, social media, press releases, key word analysis, customer and competitor analyses, etc. are all undertaken for my clients. I think that my clients are reassured that I am speaking from ‘real life’ experience, too, in that I run my own business and know the challenges that business owners face. I also work closely with my clients. This involves regular Skype chats and late night emails! It also means that I’m not limited to a geographical area. Well as you can see from the last question, lots of things have changed. However, what has stayed the same is that I continue to learn and grow in terms of business experience. I remain open to opportunity and continue to feel blessed that I am still in business. I’ve learned that when you’re in business you have to adapt to change and not stand still. Embrace the aspects of the business that you love and jump in with both feet. I would reiterate what I said last year. Running your own business is hard work. It’s time consuming, it’s stressful, it will give you late nights and sleepless nights and it will make you tear your hair out. However, and more importantly, it will be something that you can take pride in and bring you rewards if you’re prepared to work hard. Never underestimate how hard you will work when you run your own business. It does make you incredibly resourceful, though. I really don’t know how to answer that. I just hope that I’m still doing something that I love doing and I’m working hard at achieving that. I’d like to think that Maxine Johnston Marketing will be doing well and I continue to be happy! Wow – exciting times this year! I love seeing how my interviewees’ businesses are growing and changing, and hopefully sharing these stories with you is inspiring you, too. I can echo what Maxine says about embracing opportunities – although my portfolio of clients and types of work is relatively stable now, it’s very different from the student proofreading work I originally envisaged doing! Maxine’s new website is here, at www.maxinejohnstonmarketing.co.uk and you can get in touch with her via her contact page, which lists all the email addresses and phone numbers you need. Nathan’s our Boy Wonder, who started Future Visions when he was just 13!Now he’s busy developing new streams of activity and income and building his career in public speaking! We first met him back in September 2011, 8 years after he started working for himself, and he was still going strong in October 2012. Then, his plans for the upcoming year were: “I’ve always struggled to create clear, specific goals, and when I started my business I didn’t start with the end in mind. I still don’t know exactly how I’ll get there, but in a year’s time I want my business to be leveraged enough that I have 2 free days in the week to concentrate purely ON the business, to speak in schools and to mentor students.” Did he get there …? In some ways, yes. I’ve achieved most of the business goals I set out to achieve and have got the core business to a position I’m happy with. I now spend more of time marketing my own personal brand as a professional speaker. My personal circumstances have changed a lot in the last year, which is something I definitely didn’t expect, and in some ways that’s influenced both what I’ve been able to do and what I hold to be important. In the last interview, I mentioned a new product we’d developed – The Hub – an online operations manual for businesses to document the systems and procedures that are important to them. This has now become a critical product of ours which is selling very well, and we’re launching the second version of the product on a subscription model this month. I’d also recruited Tom to work directly with clients and keep operations running smoothly. He’s since gone on to start his own business, and now works with us (and a number of other clients) on a freelance basis as a virtual assistant. Similar to last year, I’m continuously learning and changing where my time is spent in my business. Every month I review where my time’s spent and trim off the bottom 10-15% and either delegate it (if it’s important) or just stop doing it altogether. I think the biggest value in any business is in its list: your customers, prospects and people you’ve met along the way. Nurturing that list and communicating with it regularly will help you to build a business where you can generate sales ‘on tap’. And that’s a wonderful thing. With that said, a big portion of my marketing efforts will be invested in making it available to as many businesses as possible. So big changes for Nathan, and an exciting new project on the go, too – I hope the launch of the new version of The Hub goes well. Nathan seems very focused this year: I like the fact that he’s constantly reviewing his activities, and this is something I’ve been writing about lately, too. It’s vital to keep reviewing what you’re doing and making sure it’s optimised to get whatever return it is that you’re looking for (financial or otherwise). The Future Visions website is at www.future-visions.co.uk and all contact details can be found there. 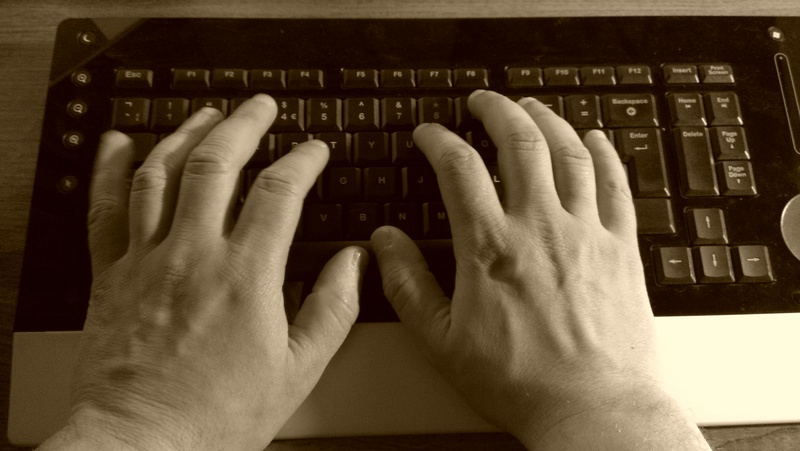 What keyboard shortcuts does the Control Key give you? I’m going to categorise these into different areas for you. For each shortcut, you will typically need to highlight the text that you want to change if you’re doing something like changing its style or copying or cutting it, and pop the cursor in the right place if you want to paste. I’ll tell you what you need to do by each one. For each one, you need to press the Control key, usually marked Ctrl (and you might have more than on on your keyboard) then keep it pressed down while you press the second key on the keyboard). Bonus shortcut: if you want to switch between ALL CAPITALS, Title Capitals and Sentence capitals on a section of text, Shft-F3 is your friend. More detail here. Ctrl-Y – REDO – lots of people know about Ctrl-Z, but did you know that you can redo an operation that you’ve undone by hitting Control-Y? Go on – admit it: did you really know ALL of these shortcuts? They’ll save you a few mouse clicks and I find some to be a lot quicker and more useful than the other methods you can use to get the same results. Which are your favourite keyboard shortcuts?